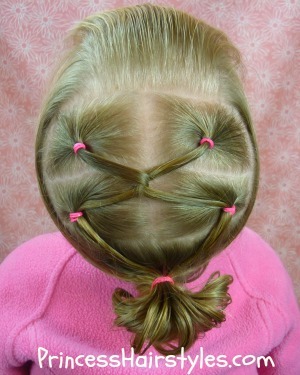 A Hairstyle For Gymnastics, Sports, Dance, Figure Skating, Cheer leading, Swimming, etc. 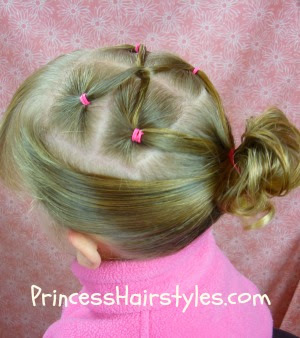 This fun "elastic hairstyle" is great for holding your hair back for gymnastics and other sports. We love it because it's quick and easy! You could finish this style with a ponytail, bun, pigtails, or by leaving the rest of the hair down. This cute hairstyle is actually a simplified variation of one of the very first styles we ever posted on our blog (back in 2008) which can be found here: Twists to the side hairstyle. Our little Pea has bangs (or fringe) but if you don't, you could incorporate the hair in the bangs area into the elastics in the front. The tiny elastics we used in this video are called "Goody Ouchless" and are perfect for tiny sections used in making elastic net hairstyles (or as my daughter calls them.... spider web hairstyles.) The elastics come in a box of 250 with 3 different sizes. We purchased them at Walmart. I love all your hairstyles! This one is brill for me because I go to gymnastics and dance twice a week! Wow! All of your hairstyles are amazing and brilliant!!! Love this as you can see by my name I go to team practice three times a week and have meets 1-2 times a month thanks!! I am new to your blog and I am loving it! Thanks so much for your wonderful ideas!! !